New from Scorpion Releasing's Katarina's Nightmare Theater line is a double bill featuring two obscure 70s horror films - Devil's Men (aka Land of the Minotaur) and Terror. Though I had heard of Land of the Minotaur (and thought it was a giant creature movie a la Godzilla), I had never seen either film before. Oddly paired considering the films seem to have little in common, there is definitely that old "you never know what you're gonna get" feeling of seeing a drive in double feature, which also appeals to me. Devil's Men stars Donald Pleasence as a priest who is investigating the disappearances of some archeology students and calls upon his private detective friend Milo (Costa Skouras) for help. They believe that the castle owned by Baron Corofax (Peter Cushing) is where the students have disappeared to and must find a way inside, despite the evil that may be lurking in the castle. Terror stars John Nolan as James Garrick, a film director who has just finished up a film about a convicted witch from the 1600's which happens to be based on one of his ancestors. After showing the film to his cast and crew, weird things start happening and they start dying one by one. Is it his family's curse or is someone else behind the mysterious deaths? Though I wouldn't consider either film a classic, Devil's Men and Terror are both entertaining. Neither of the films are very scary or even totally coherent, but they do have some factors working in their favor. 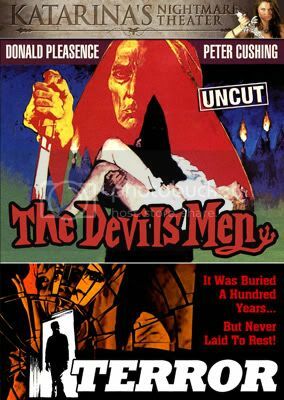 Devil's Men is saved by two horror legends, Donald Pleasence and Peter Cushing. Without them the film would probably be rightfully forgotten but they add enough charisma and presence to make the whole film come together. A few nice deaths, some satan (or minotaur) worshipping scenes and lots of dark settings help this one along as well. The electronic score by ambient god Brian Eno and end title song sung by Paul Williams (Phantom of the Paradise), two of my favorites, are just two more reasons for me not to hate this film. Terror, obviously influenced by Dario Argento, benefits by a nice whodunnit story and a professional cast (none of whom I actually know who they are). There are some good deaths and lots of interesting lighting, again seemingly pilfered from Argento. This double feature comes together on a single disc and features intros by horror host Katarina Leigh Waters and several trailers from other Katarina's Nightmare Theater titles.